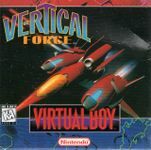 ""Vertical Force is a vertically-scrolling shooter, with two layers (to utilize the 3-D features of the system) for Nintendo's Virtual Boy video game system. It was developed by Hudson Soft and released in December 1995 to mixed critical reviews."" Source: Wikipedia, "Vertical_Force," available under the CC-BY-SA License.